OK. First I need to go through my usual spiel about how Ten Thousand Things makes theater unlike anything you've ever seen. It's as raw, immediate, up-close-and-personal, and in-your-face as theater gets. Without the usual tricks of lighting, fancy costumes, extravagant sets, or big production numbers that you often see in theater, there's nothing to distract you from the work of the actors and the emotions of the piece (which might be why they consistently attract the top talent in the area). There's no separation between actors and audience; depending on where you sit you might get stepped on, flirted with, talked to in an aside, or fist-bumped. Combine this bare-bones intimate style with their mission, to bring theater to audiences that don't normally have the chance to see theater (prisons, homeless shelters, community centers, etc. ), and you have something truly special. You simply cannot call yourself a Minnesota theater fan if you've never seen a TTT production. You have two more weekends to see this show, and if that doesn't work out, they have two more shows this season. Go see them. Now on to the show. TTT Artistic Director Michelle Hensley, who directed this piece, introduced it by saying that sometimes they like to do a show that's pure fun, and that for some of their audiences, just to laugh openly and whole-heartedly is a profound act. 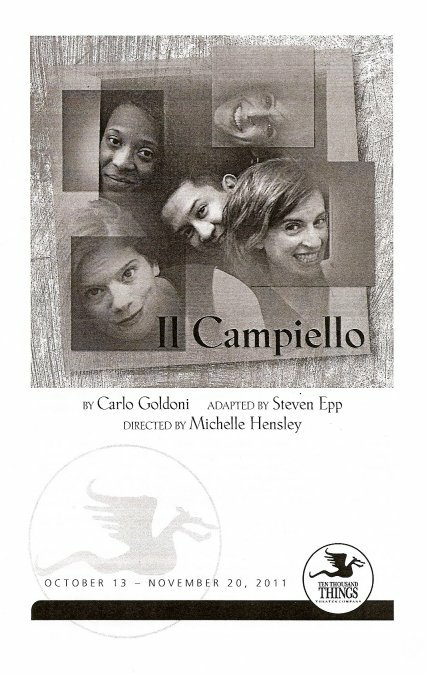 Il Campiello is profoundly frivolous and fun. The 18th century Italian comedy was adapted by the brilliant Steven Epp, who played the title role in TTT's Man of La Mancha earlier this year, and whose own company The Moving Company "does theatre." He really modernized the language of the play to great comic effect. The characters speak like today's kids obsessed with potty humor (I don't think I've ever heard the word poop uttered so many times in 90 minutes); the language is accessible and absurd and entertaining. The play takes place in a little square in Venice, where neighbors bicker, gossip, play games, and plan marriages. The plot is almost secondary to the characters and their interaction with each other. Basically, a rich man from out of town shows up to enjoy the Carnivale celebration, three marriages are arranged after a few misunderstandings, and they feast. And by the end of the show, when one character says good-bye to the little square which is the only home she's ever known, I could almost see it - the quaint little Italian square, the twinkling stars above, soft music playing in the background. That's the magic of what Ten Thousand Things does. They transform the ugliest of rooms* into something else entirely, purely through collective imagination. This nine-person cast is so much fun to watch, and they're obviously having just as much fun as the audience and enjoy playing together. Sarah Agnew (who also displayed her comedic chops in 39 Steps at the Guthrie last year) is almost unrecognizable as the homely old toothless woman trying to marry off her daughter so that she can find a husband for herself. Karen Wiese-Thompson is the tough mama trying to give her daughter away and protect her at the same time. Thomasina Petrus as the "fritter-fryer" completes the trifecta of the doting mothers. The three future brides are all delightfully different. Elise Langer (who was also in TTT's Life's A Dream last year) is the young woman who's almost an old maid (she's 18!) and in love with the peddler, even though she continually calls him poop-turd and other similar insults. Her young, innocent "best friend" across the square is Kimberly Richardson, with a girlish voice and pigtails, who likes the neighbor boy (the charming Brian Curtis James) but isn't quite sure she wants to be married. The third young woman is the subject of gossip because she lives with her strange "uncle" and has a healthy self-esteem. It was fun to see Christiana Clark**, who was so good in the very serious In the Red and Brown Water earlier this year, get the chance to be silly and light. Nathan Keeper (also from The Moving Company, whom I saw in their production of Come Hell and High Water earlier this year) plays dual roles - the brash young peddler/groom, and the strange uncle who is very stern and ... short. Both allow him to use his great onstage physicality in different ways. Last but not least, Randy Reyes (suddenly Seymour!) is the gentleman who comes to town, so suave and elegant except when he's doing the strange bow/greeting that is the custom of his land. In typical TTT style, the sound, set, and costumes are minimal, but just enough. In addition to being reluctantly pulled into the action of the play on several occasion, Music Director Peter Vitale provides the music (including some lovely accordian) and creates an atmosphere of sound in which the story takes place. He's a one man traveling band and sound effects man. The costumes by Amelia Cheever manage to look both charmingly homemade and professionally appropriate at the same time. The set by Stephen Mohring consists of four adorable little "houses" around the square, which are really just ladders with a little platform/window on top from which the residents chat, spy on their neighbors, and wave. All of this allows the action of the play to take center stage (or in this case floor), and doesn't distract from, but only enhances, the story. Another fun thing about Ten Thousand Things is that in the program, instead of lengthy bios, each actor answers the question, "Why Do Theater?" I enjoy reading their answers; they talk about connection, joy, play, being in the moment, problem-solving, spirituality, listening. But I think my favorite statement about theater is this from Randy Reyes: "It's make believe about truth." Ten Thousand Things represents the highest form of make believe, requiring their audience's participation and imagination, with the highest payoff of truth and entertainment and magic. *The lovely space at Open Book is certainly not among the ugliest of rooms, I'm just imagining what some of their other locations must be like, in prisons and the like. **Christiana is blogging about the show and the tour. It's quite interesting to read about how the show goes over with other audiences - check it out. I've always enjoyed Ten Thousand Things--their staging of Othello several years ago was the best production of Shakespeare in the Cities that year, possibly in recent years. That said, Il Campiello was horribly and tirsomely self-indulgent. Steven Epp's script is the weak link here; the hundred or so references to "poop-turds" are an exercise in the delight of attrition. The company's venture in La Commedia is not its finest. I'm sure their next show will be far better; I certainly hope so. thanks for the comment, sorry you didn't enjoy the show. obviously i found it to be quite amusing, but like many things, it's in the eye of the beholder.